Is it brown tape, not red, that’s holding your business back? The costs and logistics of shipping can sneak up on businesses. And frequent rookie mistakes can make matters worse. That’s why we’ve put together seven tips to cut parcel shipping costs. Read on to find out more. It’s an age-old piece of wisdom that the best deals come from shopping around. Don’t stick with a postage service just because you’ve always used them. Prices shift all the time, so shopping around could return huge savings in the long run. Look deeper than listed prices. Suppliers could have deals, discounts, and rewards to suit your business needs. The rise of price comparison sites makes this easier than ever, so there’s no reason to skip this step. If you need a new service (for instance, if you release a bulky new product), don’t default to your current supplier. Mix and match suppliers to ensure you get the best deal on any kind of parcel shipping you need. You probably won’t want to shop around every time you send a parcel, so take their reputation and longevity into account, too. You’ll want a service you can depend on, so take the time to research or face higher costs in the long run as you correct mistakes and reimburse customers. Here’s a business secret: most businesses would rather lose a small amount of money than a customer. Retaining a customer means suppliers have a reliable stream of income. It also reduces the chances the customer will use a competitor. This is why companies so often offer discounts to their loyal customers. If you use a postage service regularly, try discussing bulk purchase or regular use discounts with them. Don’t be put off if they don’t advertise it; often you’ll only get them by asking. Frequent buyers should try to get an account manager within your chosen courier. This agent will support you with technical advice and be open to discussions about discounts. Of course, just because you have a discount with one supplier doesn’t mean you should stop there. Try to get discounts on the main companies you’re going to use and you’ll get huge savings in the long term. Many couriers offer free boxes and packaging to businesses. This is a great way to get thrifty with your parcel shipping. The micro-costs of packaging can add up to huge amounts over time, so this is a little bit of penny-pinching you’ll thank yourself for. Again, don’t be afraid to ask what the supplier can offer. Some will trip over themselves for your business, and the worst they can say is “no”. Using free stationery can put a huge dent in your parcel shipping costs. Have you ever used Amazon’s option to group parcels? At the potential cost of delaying items, you can receive them as a single package. For the consumer, this means less inconvenience and less waste. 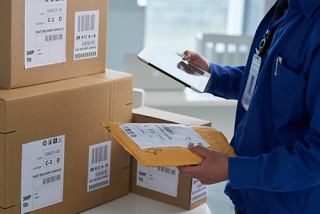 For the dispatcher, grouped packages can save on cost. Win-win. Grouping parcels can involve some tricky inventory management and strong organizational skills from the packaging department. But the trade-off is lower parcel shipping costs, which can add up to huge savings over time. This option works better for mid-to-large size businesses, who expect to receive orders of multiple items and have the postage department to handle the extra admin. Buying packaging supplies can seem like a logistical nightmare. And the costs can rack up quickly. Be sure to treat your supplies like a real aspect of your business. Log how much you’re spending and on what. Track your stock and calculate how much you need to buy. Ditch the frequent trips to the supplies store and order items in bulk. Negotiating rates can apply here, too. Approach your stationery supplier or postage company and ask about bulk rates for frequent buyers. Companies are often happy to take a hit to keep hold of a loyal customer. Free postage is a crowd-pleaser, but it isn’t right for every business. Offering free postage entices customers to confirm their purchase. But it can be a lossy option for smaller companies and soon eat into profits. Even if you offer discount postage as an alternative, you’ll still be covering some of the costs. Despite the rise of services like Amazon Prime, most customers would still rather save money than receive a parcel sooner. Offering short turnaround on parcels could be costing you huge amounts for no tangible benefit. Take a close look at the buying habits of your customers. Think about how you can incentivize purchases outside of free delivery. Try customer-friendly alternatives like scheduled deliveries. If you get it right, there’s a good chance your customers won’t even notice free delivery is missing. You can even think about modifying your checkout page. It’s a basic rule of web design that visitors will click on the most accessible options. Default your checkout to slower, paid postage or tuck expedited postage in a drop-down menu. Despite their best efforts, postal suppliers don’t always deliver on their intentions. Many of the big names offer refund services to businesses when delivery falls short of expectations. Don’t feel bad claiming these – it’s no different than getting a refund for a faulty product! Claiming back service fees can cover the costs you’ve incurred from unhappy customers. Even if you haven’t received complaints, they can return some revenue to you. Suppliers don’t want you to take your custom elsewhere, so leverage your position as a customer to save some cash. The smartest entrepreneurs plan their business top to bottom, and parcel shipping should be no exception. Take these tips on board and draw up an action plan for your shipping logistics. You’ll soon find yourself cutting costs and making huge savings. Need more advice? Why not contact us? We’d love to hear from you!